The existence of global warming, of course, make the planet Earth is changing. Many theories that the planet is not healthy. There are some indicators that could be a determinant of health status that states the earth. 1. Melting of ice in the Arctic (North Pole). A new study estimates that could melt the Arctic waters and are free of summer ice at least 30 years sooner than previous estimates. Melting of ice in the Arctic this could strengthen the trend of global warming and endanger the occupants own the North Pole, from humans to polar bears. 2. 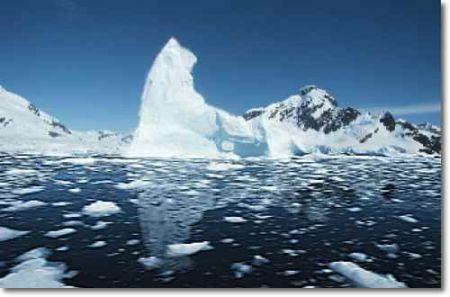 The collapse of ice sheets in Antarctica (South Pole). Wilkins is one of nine Antarctic ice sheet has receded or collapsed in recent decades. Layer of ice that fell the most dramatic is the Larsen A and B, which collapsed suddenly in 1995 and 2002. 3. Hole in the ozone layer. Ozone layer protects the Earth by absorbing harmful ultraviolet rays. But a lot of chemicals and contaminants can make a big hole in the ozone layer. Need time to dozens of years to restore the ozone layer, as before. 4. The spread of marine dead zones. Coral reefs are important marine habitats for many marine species. But the last few decades, many coral reefs are in crisis due to overfishing, marine pollution, diseases, warming and ocean acidification. Ocean waters become more acidic because it absorbs carbon dioxide from the atmosphere. This means more air pollution, sea water more acidic. Areas of rain, especially rain forests are the main areas of biodiversity, forests absorb carbon dioxide and produce oxygen. However, the rate of global deforestation could reach about 32 million hectares per year. In addition, the drought caused by global warming could worsen the situation of forests in some areas. 7. Pollution of the water. Two-thirds of the planet Earth is covered by surface water. When the water is contaminated, of course, can lead to the beings living on earth can not live. The impact of global warming are also changing the pattern of the availability of water for drinking and agriculture. 8. Buildup of greenhouse gases in the atmosphere. Carbon dioxide and other gases trap heat is a pollutant that could increase greenhouse gas emissions. The number of factory and vehicle emissions will increase the amount of greenhouse gas emissions. 9. Animals are threatened with extinction. When habitat changes and threatened, the animals in it are also under pressure. 2008 Red List of endangered species published by the World Conservation Union identified the almost 45,000 species threatened with extinction. 10. Rapid population growth rate. In 2007, world population exceeds 6 billion. That year also marked the first time in history more people live in urban rather than rural areas. Six billion people continue to compete to survive with limited natural resources, such as water, food and fuel.